Jell-O Jelly Powder in the dough makes these sugar cookies even more special. 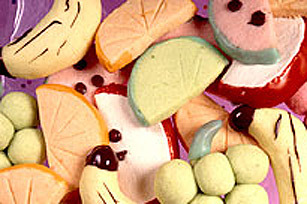 You can make a variety of fruit-flavoured cookies by just switching up the jelly powder! BEAT margarine at medium speed of electric mixer until light and fluffy; beat in jelly powder. Mix in egg. Stir in flour and baking powder. SHAPE dough as illustrated; chill 2 hours. CUT and bake at 350°F for 8-10 min. ; cool. GLAZE: Mix 2 cups icing sugar and 3 Tbsp water until smooth. Blend in 3 to 4 drops food colouring to tint to desired colour. Dip edges of cookies in frosting and dry on rack. use Strawberry or Mixed Fruit. Decorate with mini chocolate chips.